If Joey Votto puts his mind to it, he can accomplish anything. One of my minor pet peeves is when people make a comment about devoting more than 100% to a certain task. Technically, that’s impossible. Sure, I understand what the person means: they’re devoting all of themselves to whatever it is they’re talking about. A person has 100% to give to something at any given moment. Anything more than that is not something that a person is capable of. Except for maybe Joey Votto. The more I read about him and his approach to the game of baseball, the more I think he could do anything he set his mind to, even breaking the laws of mathematics. I mean, just look at one of the finer points of Pete Rose’s that he’s taken to heart. “Early in my career, Pete kept an eye on me,” Votto said, “and the one piece of advice he gave me was, ‘When you get the second hit, get the third hit. And when you get the third hit, get the fourth hit. And when you get the fourth hit, get the fifth hit.’ That really stuck with me, because it’s a genuine challenge when you’re tired, or you’re sick, or the score is mismatched, or you’re facing a tough pitcher, or you’re not in a good mood that day. Whatever it is. It’s the epitome of never giving up an at-bat, no matter the situation. And it appears to be rubbing off on other Reds. Shin-Soo Choo is an obvious example. Choo has seen his on-base percentage explode so far this year compared to his career percentage. While that could still come down to earth, it may not, and Choo’s already crediting Votto for his smooth transition to the National League. Choo has used Votto as a major resource in his acclimation to the National League. If he’s not picking Votto’s brain on the pitcher he’s about to face, he’s eyeballing Votto’s at-bats from the dugout or the basepaths for subtle tips on how to approach different situations. Even Xavier Paul is getting in on the not making outs train. His on-base percentage is third on the team. As he said to John Fay, “To me, on-base percentage is lot more impressive than batting average.” Obviously, hits are a component of getting on base, but the growing realization among Reds players about the value of each out is refreshing to see. Hopefully, the manager will one day see that, as well. 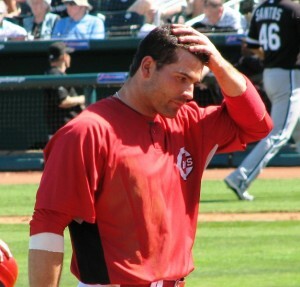 All in all, Joey Votto is awesome. We all already knew that, except maybe for a certain micro-processing fart funnel. But it’s always nice to see stories outside of Cincinnati reflect that. Posted in Cincinnati Reds, Human League, Joey Votto, NL Central.